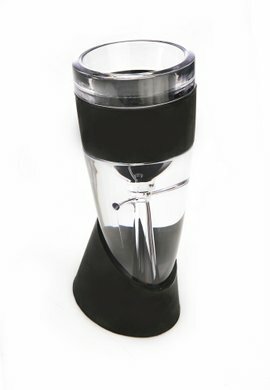 Get all of the taste with none of the wait with this instant wine aerator. People need oxygen to breath, plants need oxygen for photosynthesis, earth's largest mammal, the whale even needs oxygen, and so does your wine. Whether its your Italian Chianti, or French Bordeaux, Australian Shiraz, or the classic Napa Valley Cabernet Sauvignon, they all share the need for oxygen to bring out the true flavour and bouquet. The Instant Wine Decanter instantly breathes life into your glass of wine. Simply hold the decanter above your wine glass and pour your wine through the decanter directly into your wine glass. The Instant Wine Decanter guarantees to aerate your wine instantly to achieve the enhanced flavours, bouquet and smooth finish of a wine that has been left to breathe. Waiting for your wine to decant is now a thing of the past.! Set includes: 1 x aerator, 1 x stand & 1 x instruction booklet.